A call-to-action is a marketing term for an invitation to take a specific action. It is usually given in a straight-forward and direct manner, like “sign up now” or “buy now”. But why do you need a call-to-action? If you explain a concept well, wouldn’t your readers understand you and know what to do next already? Why the need for an obvious call-to-action? Think of an everyday situation. A group of friends is having an enjoyable conversation when they began to feel hungry. Unless someone speaks up and say “let’s go get some food”, most people would go with the flow. They’d continue to hang around. It takes vision and a lot of energy to overcome inertia and move against the current state. An external impetus helps to initiate the pattern interrupt and cause a desired action. People read. They think and they understand. Yet they put off making decisions or taking actions. A call-to-action gently (but firmly) sends out the invitation to take the next desired step. There is no results without actions. The best strategy will not bring any results without people taking action. The success of your business (and life) depends on you and others taking very specific actions in a timely manner. That is why there is often a sense of urgency conveyed in call-to-actions. What sets a business blog post apart from a personal journal? A personal journal does not require the reader to do anything apart from enjoying the writing. But every piece of marketing copy needs to make a specific call-to-action or it will not serve any purpose. Even teachers end their lesson with a call-to-action; with an instruction to do some exercises. 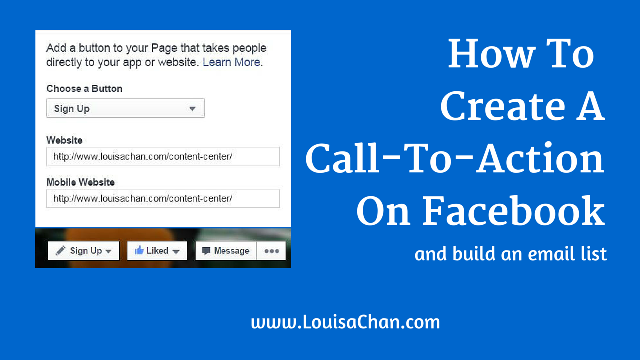 When I saw the option to create a call-to-action button on my Facebook page, I immediately tested it out. It’s very easy to set up and you can do this in a couple of minutes. Don’t worry if you don’t see one for your page yet. Facebook is rolling this out, just wait. But once you have the option, I would encourage you (here’s a call-to-action) to use it. Here’s a 2-minute video tutorial that shows you how this can be done. The challenge here is in deciding which type of action you want your audience to take – and that depends on the the goal you want to achieve. Let’s see what Amazon has on their Facebook page. It is hardly surprising that Amazon would invite you to “Buy Now”. But let’s see what the New York Times has for the call-to-action on their Facebook Page. Expecting a “read more” for a publisher? They’ve decided to go with “watch video” because “read more” is not an option. Is Facebook subtly showing us their emphasis on video? What would you choose for your call-to-action? What would be your most desired action from your readers?